Thank you for choosing DeCarley Trading. We are proud to offer the DeCarley Perspective as an informational guide to our clients and hope that you walk away from the newsletter with a better understanding of market fundamentals, as well as technical and seasonal factors. 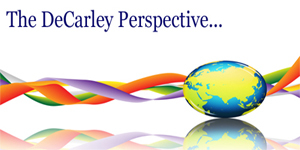 The DeCarley Perspective is intended to give you a broad based view of the financial and commodity markets and provoke you to explore various market approaches. We appreciated any feedback that you can offer us in how to make this newsletter better. Please feel free to communicate with us regarding your needs and wants. **Past performance is not indicative of future results. There is a considerable amount of pressure on the equity market bulls in the month of January. According to the Stock Trader's Almanac, every negative January for the S&P 500 since 1950 has preceded a new or extended bear market, a flat market, or a 10% correction. The market's fate in 2010 has yet to be determined, but we feel as though the odds favor a sizable correction at some point in the first quarter. The rally from last year's lows has exceeded even the most optimistic outlooks and as a result, the market seems to have become complacent once again. Complacency can sometimes be the precursor of a dramatic spike in volatility and a downturn in stocks. Supporting this premise, the CBOE's volatility index (VIX) is trading at its lowest level since the October of 2008 just before the market melt-down. Although we think a correction is in order, we also doubt that the market will suffer tremendous losses throughout the year. In fact, we believe that a large dip in early 2010 would be a tremendous opportunity for the bulls. After all, the first five trading sessions of January were positive and this has historically been an indication of good things to come. Of the last 36 occasions, 31 of the years in which the first five trading days posted overall gains were followed by a positive year for equities. Keep in mind that November, December and January constitute the year's best three month span but the market begins to struggle seasonally in mid-to-late January and February is the weakest link in the "best six months". The S&P has averaged a draw of 2.9% in the last 11 years. In the last newsletter, we pointed out that the S&P seemed to be on a path toward 1150 before a correction could occur. Since then, the March S&P has peaked out at 1148 and traded lower to the 1127 area. That might have been all that the bears had in them this time around. We believe that the bulls are destined for a retest of the recent highs and will likely see prices near 1160 but we continue to be bearish at such levels. 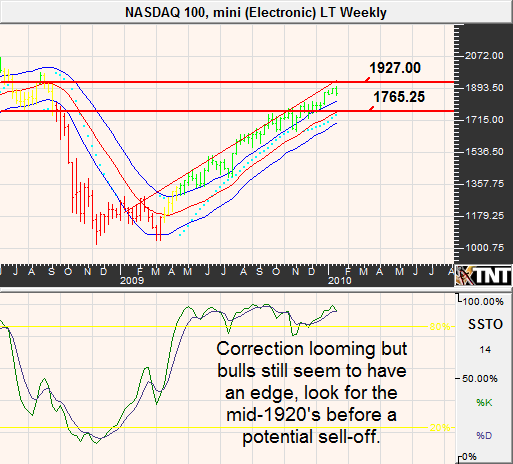 The NASDAQ might see prices as high as 1923 before selling pressure returns. Treasuries have suffered relatively dramatic losses in the month of December despite seasonal tendencies that suggest otherwise. However, rekindled concerns over the default risk of government debt issued overseas as well as domestic municipal bonds (namely the state of California) had renewed the appeal of Treasury bonds and notes. Of course, investors haven't forgotten about the massive supply of debt issued by the Federal government and this likely kept a cap on the size of the rally. With short-term rates sitting at nearly zero and long-term maturity yields on the rise the curve is near historically steep levels. Although it is obvious that short-term rates will eventually need to move higher, we doubt that it will be immediate. In fact, the Fed Funds futures markets have pushed back the expected date of Fed tightening once again as most aren't looking for any moves until late 2010. Accordingly, it might be the (slightly) less manipulated end of the curve that will have to adjust to keep the yield curve at a more "normalized" slope. Accordingly, bonds and notes might continue to defy gravity, and many analysts that have been persistently calling for a large sell-off in fixed income securities as inflation takes hold and the reality of the Fed's balance sheet sets in. In last month's newsletter, we noted that there was some risk of a slide to 116'08 in the 30-year bond, but we now know that the market exceeded our expectations by trading in the high 114's. However, the market has recovered from the lows and we believe that the overall direction will be higher in the coming weeks or months. The current recovery from the lows seems to be largely on short covering. Although, we think that there will eventually be much more buying it seems as though the market is approaching near-term resistance. 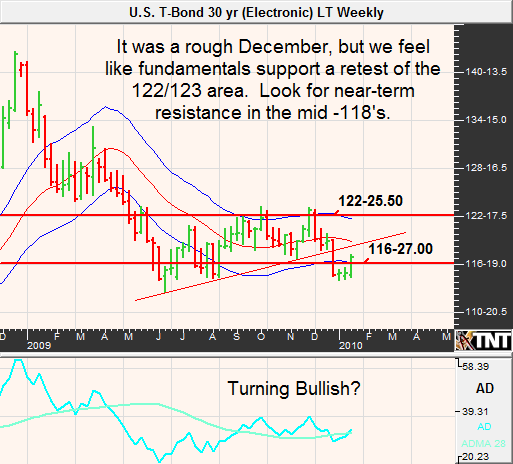 We are looking for the 30-year bond to hold resistance near 118'15ish the first time up but should eventually see prices has high as 122/123. 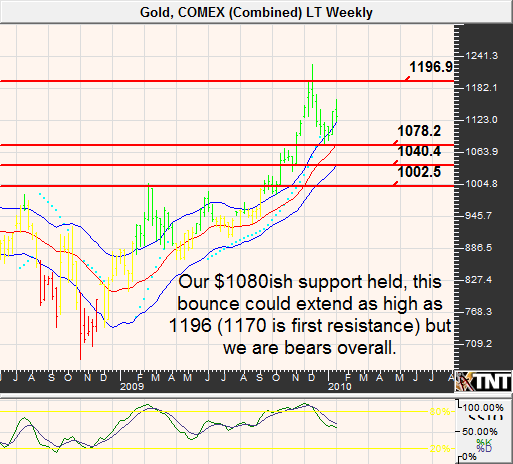 In the meantime, support lies at 115'24 and again at 114'05 but we believe that the first support level will hold. Resistance in the note lies at 117'27 but we are looking for an eventual move back to the 120 area; support is near 116'08. A bearish USDA report combined with news that the Chinese government was beginning to tighten credit triggered massive selling across the grain complex on January 12. Since then, the markets have managed to stabilize but are still facing the burden of what appears to be a prospect for a stronger dollar. As we know, a stronger dollar makes dollar priced commodities more expensive for foreign consumers. On January 12, the USDA increased its estimates for the 2009/2010 ending stocks to 1.764 from 1.675 billion bushels. This is up slightly from the year before but the rather large expected production gave the bears an edge. Similarly, ending stocks globally are expected to fall from 146 billion tons to 136. Although the numbers provided in the USDA's report were moderately bearish, it seems as though the Chinese news was the catalyst for the limit down move and subsequent turmoil. Nonetheless, despite all of this the March corn futures contract has managed to stay within (for the most part) its trading range. 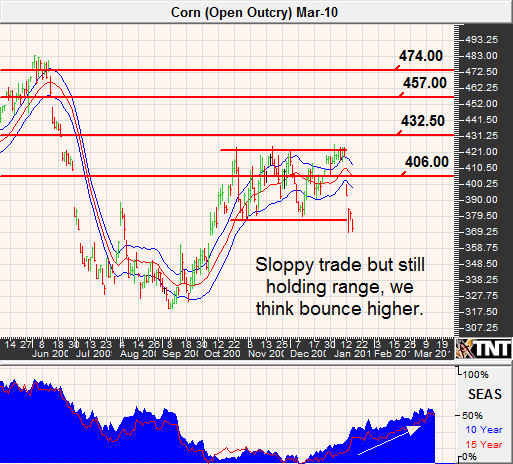 We can't help but feel as though the seasonal tendency for higher corn prices will be enough to at least spark an oversold bounce above $4.00. Unfortunately, the possibility of a stronger dollar might keep the buying moderate. Don't forget that there are a lot of gaps left to be filled, it might not be immediate but perhaps at some point later this spring it will be possible. As was the case of most commodities, soybeans suffered at the hands of news of the Chinese government putting the brakes on economic growth. However, thanks to a relatively neutral USDA report the market weakness didn't climax in the same way that corn futures did. The USDA estimate of ending stocks for 2009/2010 was reduced by 10 million bushels to 245, but this is still much more comfortable than the 138 posted last year. This leaves the stocks to use ratio at about 8%, the highest since 2007. Annual stocks, on the other hand, are sitting at 25% of annual use. The headlines were bearish, but not necessarily surprising to the markets. Last month we were looking forward with a bullish tilt, but as the month unfolded it was clear that we were wrong in our assumption that near-term support areas would hold. 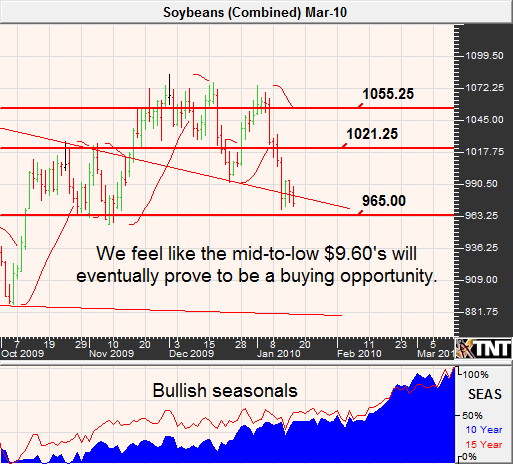 With March beans trading well under $10, the market appears to be oversold and due for a corrective move higher. However, our opinion of a dollar rally prevents us from becoming overly bullish beans. Look for resistance near $10.21 and then again at $10.55. Although the negative correlation between the dollar and some commodities has become fuzzy, we feel that crude prices will have a difficult time ignoring potential strength in the greenback. According to the Commodity Trader's Almanac, the energy markets normally experience "continued" weakness in January but a February bottom is typically seen. According to the U.S. Energy Department, surplus capacity in crude oil was at 5 million barrels per day in December. This is far more margin than was seen in 2008 when the surplus was 1.5 million barrels. Also, OPEC is predicting that global consumption in 2013 will be 87.9 million barrels per day which would equate to a surplus of about 6 million barrels. Therefore, aside from unexpected disruptions in production, political turmoil, etc the fundamental picture isn't overwhelmingly positive. That said, energy futures trade has always been dominated by emotion and that will likely remain true. Despite swift selling throughout December, gold has managed to maintain its overall uptrend. However, it seems as though market fundamentals will work against the metal even if there are some near-term gains from current levels. According to our sources, gold has a tendency to peak in mid-February but seasonals aren't perfect and if we are right about the Dollar, gold prices will struggle in the coming weeks. Additionally, projected gold production in 2009 is expected to be the highest seen since 2002 and according to the World Gold Council, gold demand was down 34% in the third quarter of 2009 from the previous year. February gold managed to hold our first downside objective near $1,080 and the subsequent bounce could force prices as high as $1,195. This is based on technical projections, along with seasonal strength and the fact that there are still some long-term bulls looking at the dip as a buying opportunity. 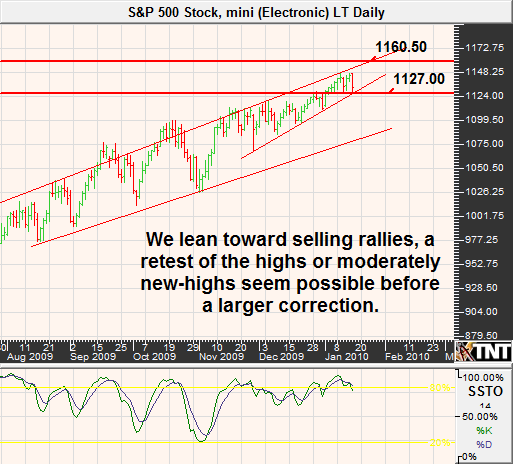 We doubt that the rally will last in the long-term but wouldn't be willing to sell into it at current levels. First resistance will be near $1,170. The greenback has retraced the most recent rally by approximately 50% and we feel as though this is enough to qualify the move as a healthy digestion. 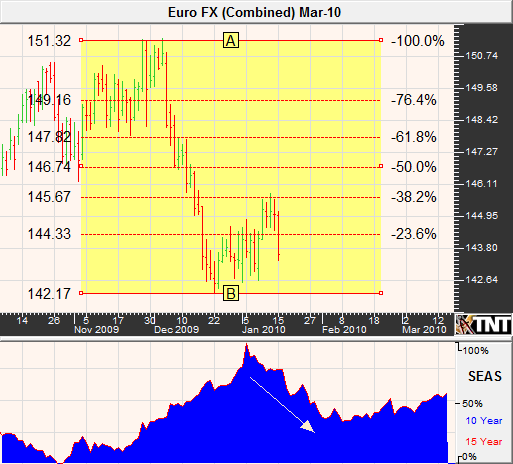 Also, seasonal tendencies suggest that the Euro will begin to struggle against the U.S. dollar and because the dollar index is heavily weighted by the Euro this could be a catalyst for buyers. The markets are aware of the extremely low yields backing the dollar, but traders were recently reminded that there are no free lunches. Those that are in the carry trade (short dollars and long a better yielding currency) will have to actively manage their position in order to avoid the wrath of the unwinding. This alone should keep dollar bears on their toes, and also promotes short covering on large dips. In the previous DeCarley Perspective, we noted that we liked the idea of waiting for better levels to be bullish the dollar and bearish the Euro. This time around, those better levels have come and gone (without quite reaching our targets) but we still prefer to be "long" the dollar with futures or options. 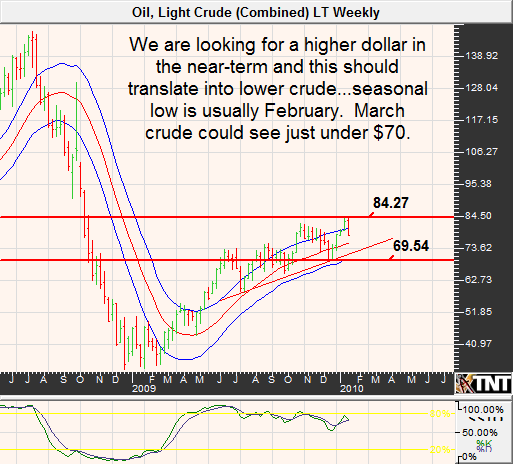 Look for support in the March Dollar index near 76.60 with the first area of resistance on the way up being 77.90 and then again near 78.80. Being bullish the dollar means being bearish the Euro and given economic fundamentals in the Eurozone, that doesn't seem to be such a bad idea. Unemployment rate in the Eurozone is hovering in the 10% range, similar to that in the U.S. This is the highest since the Euro's inception in 1999. Additionally, the third quarter GDP was reported to be a stagnant .3%. Clearly, both currencies are backed by struggling economies and therefore the Euro's $1.44 valuation seems a bit steep. We are looking for a retest of support near $1.42 but warn that prices might struggle to break support at this level. Sugar prices continue to be propelled higher by tight supplies and the fact that it is an efficient ingredient to making ethanol hasn't hurt. Last month we accurately predicted a break-out to the upside, but had you listened to us too closely you would have missed the move as we had expected a bit of a pullback before the move. Now that prices are sitting at such lofty levels, it is hard to be a bull. 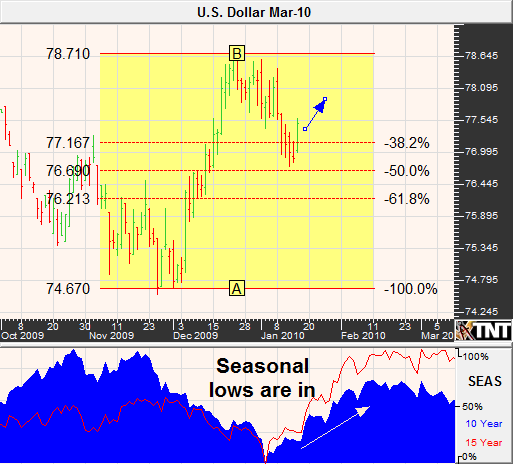 Seasonals are mixed at best and the chart is a bit chaotic. If you want to play this market, we prefer the downside but encourage traders to patiently wait for higher prices even if that means missing the trade. As of late, sugar has been a merciless market and it is best to play it conservatively. The previous resistance of 26.25 now becomes support, and 25.86 is the secondary. Resistance lies at 28.50 and then again at 29.30. Coffee prices have been putting in higher lows since June of last year but can't seem to put together a string of higher highs. The market has been facing firm resistance near $1.50 for quite some time but failure of the market's ability to surpass old highs will begin weighing on prices. 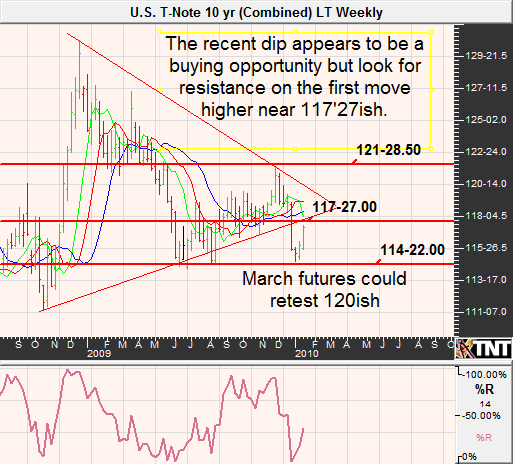 The weak technical action is occurring even as Coffee fundamentals remain overall supportive. Last month, the USDA estimated that the 2009/2010ending coffee stocks will be at 34.7, leaving the stocks to use ratio near 26%. This is quite a bit lower than what has been the case in the most recent five years. Similarly, the International Coffee organization expects that "coffee supplies are likely to remain tight in 2010." The seasonal high in coffee tends to occur in late January to early February, so the bulls are running out of time. We see support in March coffee near 139.50 and as long as this area holds the market should retest the highs near 149 before succumbing to price pressure. On the other hand, a break of support would mean a slide to the mid-to-low 130's. 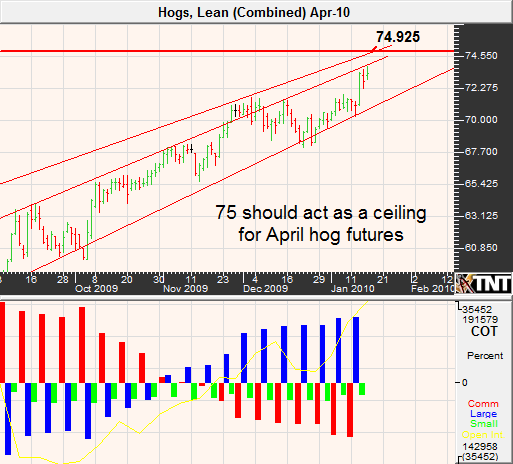 A weather related rally pushed hog prices well above 71 cents to test the annual highs. After what appeared to be a bleak outlook for hog ranchers following the swine flu epidemic, the market has made a nice recovery. In addition to weather, exports have been stronger than anticipated and the forecasted decline in production from the first to second quarters is expected to be near the second largest in history; this leaves the overall fundamental assessment pointing higher. However, as we all know...when all of the bullish news is out and the market has already reacted, it makes it difficult for further gains. At this point, the bulls are already in and the bears are licking their chops. The long-term outlook might be higher for hogs, but we can't help but be bearish. COT numbers suggest that large traders have become "too long" while small traders have remained short throughout much of the rally. To us, this seems to signal an upcoming reversal that could bring the April hog futures back to 70 cents. Strong seasonals and relatively tight supplies could be undermined by high unemployment, abundant supplies of port and poultry and of course the recession in general. When times are tough, consumers opt for less expensive alternatives and this could keep demand under wraps. As we had expected, cattle prices made a dramatic low last month as small speculators were simply "too short" leaving the market oversold. The technically induced rally has extended itself to the top of the down-trend channel and we doubt that the market will be able to blow by this resistance without some back and filling. 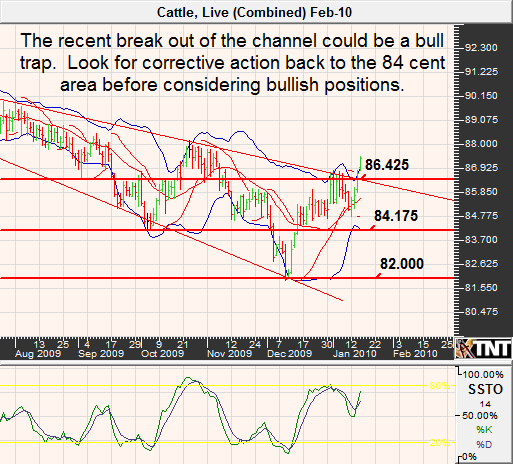 Look for a down-move to find support near 84 cents before considering being "long" the market. Please contact us with any questions, comments or concerns that you have regarding this newsletter. We would be happy to work with you to build a strategy that fits your risk and reward profile as well as your personality and market interests. **There is substantial risk of loss in trading futures and options. Past performance is not indicative of future results. The information and data in this report were obtained from sources considered reliable. Their accuracy or completeness is not guaranteed and the giving of the same is not to be deemed as an offer or solicitation on our part with respect to the sale or purchase of any securities or commodities. Any decision to purchase or sell as a result of the opinions expressed in this report will be the full responsibility of the person authorizing such transaction.